Grand Caribbean West - top floor unit! - Gulf Views! - Steps to Beach! 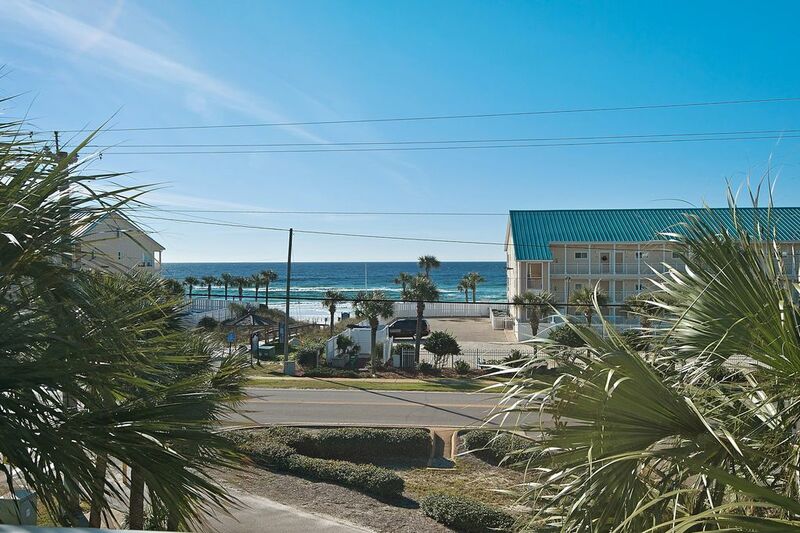 Our condo is located in Destin's Crystal Beach area, just across the street from the emerald green waters and white sands of the Gulf of Mexico. This adorable one bedroom condo sleeps 6 and is stylishly decorated and fully stocked to make your vacation truly enjoyable. It has a private wrap around balcony with a spectacular view of the Gulf. Just minutes from all that Destin has to offer, but in a quiet locale for enjoying the peace and quiet. If you like fishing, golfing, swimming, boating or enjoy shopping till you drop, Destin has it all. Enjoy some of the great local restaurants in the area, Capt. Daves, Pompano Joes, Aj's, The Crab Trap or we now have several new places, Outback, Chili's, TGIFridays, Red Lobster, Cracker Barrel and many more to discover on your own. Give me a call, I would love to have you stay here at GCW-301. What to do besides enjoy our wonderful beach...: Should you wish to explore what the local area has to offer, you'll find an abundance of choices. Sidewalks line scenic 98 for walking, running or bike riding. We are a short drive to the Silver Sands mall to the West, or luxury shopping at Destin Commons to the East. Kenny D's, The Crab Trap, and Pompano Joe's are all within a short drive. We encourage you to leave menus of your favorite restaurants when you come. For evening entertainment, Destin is known for some wonderfully upscale eateries, as well as your regular fare. Friendly night life and nearby state of the art movie theater. Baytowne Wharf at Sandestin Golf & Beach Resorts offers wonderful dining and specialty stores as well as great festivals & events that are held at the Market Shops Green or the Center Plaza within the Village. More things to see and do! : The Silver Sands Outlet Mall is a vacation in it’s own right for shoppers you will have access to over 100 stores, including, Polo, Ralph Lauren, Banana Republic, Brooks Brothers, Eddie Bauer, Liz Claiborne, Tommy Hilfiger, Lenox, Nike and Reebok - just to name a few. When you need to pause for nourishment choose from Panera Bread, Cheeseburger in Paradise or Carrabba's Italian Grill. More great shopping can be found at the Destin Commons outdoor mall. Enjoy such great stores as Abercrombie & Fitch, Ann Taylor Loft, Banana Republic, Belk, Books-A-Million & Maui Nix Surf Shop to rattle off a few. Stop for a bite to eat at the Hard Rock Café, Panera Bread, Tony’s Ristorante or Sushi Siam. More than just shopping the Destin Commons Center Plaza offers a soft-play kids playground and a 49-head pop fountain. Community activities and entertainment are held through the year at Destin Commons . Rave Motion Pictures is also housed at Destin Commons to catch the latest releases. Of course we can not forget to mention Golf! : Dont forget our wonderful Golf courses! There are (10) Championship golf courses within a few miles of this location. Each offers its own character and challenges. All are public courses with full service facilities with a restaurant, practice range, rental clubs, professional lessons and pro shop stocked to meet your needs. Destin, Florida is known as the ”World’s Luckiest Fishing Village,” & boasts of being home to the largest fishing vessel fleet in the state of Florida. Fish from the beach or boat. If you do not want to bring your boat, one of Destin’s many charter boats would love the opportunity to take you out for full or half day excursions. Water surrounds Destin with the intercoastal waterway to the north and Gulf on the south, creating an abundance of water sports available, including kayaking, wave running, parasailing, kite surfing, snorkeling and so much more! There are water parks and gocarts for the kids, and fishing, boating, swimming, golfing, dinning, & shopping! We provide all the linen and towels for your stay with us. our condo has a wrap around covered balcony with a lock out gate. We also have the resin patio table and chairs for our guest! Seascape Golf/Tennis resort is less then 5 min. drive down scenic beach road! Heated during cooler weather season! Grilling is permitted in the designated areas on either side of the pool. No grills are allowed on the balconies. This unit is exactly what the pictures show!!! The unit is extremely clean and the location is very quiet. Access to the beach is exactly across the street and only about 15 minute drive to the boardwalk. Lots of restaurants to visit if you decide not to cook. We did not use any of the amenities in the kitchen other than the refrigerator. I am so pleased that you enjoyed your stay! I hope you will come back again soon!!!! We love the location of this condo. We have stayed here for many years and we are always pleased. I am so sorry, I just noted that my response had not been sent for your review! I am so pleased that you enjoyed your stay and I hope we hear back from you again soon! Liked the view and balcony. Very nice and clean. Made the trip home safe. Thank you for taking the time to write a review! I am so pleased you enjoyed your stay! The condo itself was very nice with updated kitchen, bathroom, and furniture! Everything is as pictured, we were very pleased with the quality. Lots of beach toys for the kiddos. There were boogie boards, but all were broken. I will say the “rainy day box” for kids could use some updating. Unfortunately we had a lot of rain on our trip, so we actually had to use it. Also, the balcony does wrap around the building and small kids can get out. If you are looking to contain the kiddos, keep this in mind. We weren’t able to enjoy the balcony and ocean view to its full extent, but would be awesome for family with slightly older children (or very well behaved toddlers)! We chose this condo over others because of the high responsiveness and availability of Kathy, who manages the condo, while booking. However, when we arrived the first day at 4:30p, the keyless entry didn’t work and we didn’t have the code for the emergency key. I called and emailed Kathy several times and calls went straight to voicemail. I figured her phone was dead and there was no other way to reach her. We eventually headed down to the pool when we couldn’t get through because our kids are 3 and 2 and couldn’t understand the wait. We finally got ahold of maintenance who said they couldn’t help us but he thinks the keyless entry battery might be dead (it was). Eventually Kathy called us back and after over 2 hours of waiting, we were in the condo. The emergency key box was corroded so could not be accessed. Losing 2 hours was quite disappointing after a 14 hour drive. Kathy did apologize several times for her phone dying. We had another issue and had to contact Kathy again, which she responded to right away. Unfortunately, the weather was terrible the rest of the week, so with two young kiddos trapped inside, we really didn’t enjoy our stay in Destin and left 2 days early. This is obviously no fault of Kathy’s but it was disappointing to say the least! I am so sorry for the problem getting into the condo! My phone had never let me down like this before! It was very unfortunate that it was an extremely rainy week during your stay. I will go thru the rainy day box as well to ensure that it is updated!